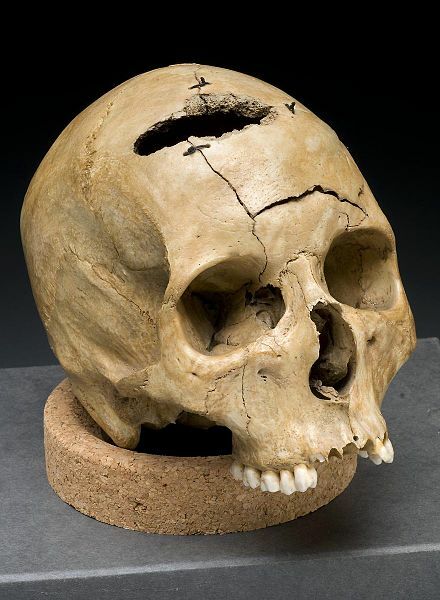 In an article in the York Daily Record, it is reported that a skull of a Civil War soldier from the Battle of Gettysburg will be auctioned off in Hagerstown, MD on Tuesday (6/3/14). Along with 13 other artifacts, it was found in 1949 at the location of a farm hospital two miles north of Gettysburg. Before I go into the ethics of this, I’ll say that this is the sort of thing that could only happen in Hagerstown. This month marks 20 years that I have now lived in the Hagerstown/Washington County area. And though it is a beautiful place to live, especially for a history geek like me, I’ve never seen a place with quite the same manner of self-inflicted low esteem issues. Whenever there is a listing of the top 10 cities with ugly women, dirty men, obese cats, bad breath, or flatulent bovines per acre, Hagerstown never fails to make the listing. But this is a new level of shameful ignominy – to auction the human remains of a person who very likely laid so costly a sacrifice upon the altar of freedom; although, the auction is simply being held in Hagerstown – not that the city or county has really anything specifically to do with it beyond being centrally located … but again – where else would this happen? Perhaps the area is the victim of some skullduggery, which, by definition means “crafty deception or trickery or an instance of it.” So where does a word like that come from? Apparently the etymology relates to an alteration of a Scottish word of similar sound and is not related to human skulls. I have often wondered when walking through museums—such as the British Museum in London with all the Egyptian mummies, etc.—when do human remains cease to be worthy of honor and dignity and cross the line into an artifact of history? And for a chunk of human remains to be auctioned off to the general public is a new category entirely from something on display in a museum, where at least there is a dignified context for the item. An individual is quoted in the article referenced above as saying, “I don’t have anything to say whether or not it’s right or it’s wrong. I still think there’s something there that just doesn’t feel right.” And that sentiment would certainly echo the feelings I’ve seen and heard from some of my Civil War pals. So, if this is ethically just fine, how about we get really literal with “skullduggery” and do some skulldiggering? If there is a market for Civil War skulls, we could fine hundreds of them in the cemetery at Antietam—and I’m simply referencing the “unknowns” graves. Some of these skulls might be extra cool with a minie ball encased in them! They would bring an especially high price! The proceeds could be given to the Battlefield for preservation work. What an idea! Those guys won’t mind being dug up, and there aren’t any descendants to deal with. Does that help put the Gettysburg skull into any different light? I fear we live in a very strange age relative to an appropriate understanding of the dignity of human life. WASHINGTON COUNTY, Md. – The skull of a Civil War solider was expected to be auctioned off at the Best Western Grand Venice Hotel in Hagerstown on Tuesday. And that’s exactly what is going to happen. After numerous calls and complaints, Taylor told WHAG they’ve decided to give the solider’s remains to the United States Parks Services in Gettysburg, Pennsylvania as a gift. The park is expected to hold a funeral and proper burial for the solider. Originally, the sale was believed to be the first of its kind. The remains were found in 1949 on the Benner Farm in Gettysburg while someone was tilling a garden. The bidding for the remains has been removed from an online website. The park service will arrive at Hagerstown on Tuesday where the remains will be handed off. The auction will be held at the hotel tomorrow at 1 p.m.
Posted by Randy Buchman on June 2, 2014 in Antietam / Battlefield Guides, General Civil War Themes, Gettysburg Campaign and tagged Civil War skull auction. Unbelievable that people are so crude and disrespectful of our soldiers no matter when or where they died. Hey Doug – You’ll probably see on the local news that the situation has a much better ending. This is worse than a “grave robbing” incident I saw on ebay two-weeks ago. They were auctioning a GAR Post 132 star on a spike of the type found on graves. I wrote to the seller, who has multiple Civil War items for sale/auction. However, the response I got back was as follows, “thank you for your concern. the family of this man in kansas sold it to me. they do not want it. i believe the way to find the home that will best love and respect this grave market is to sell it. when someone pays money for something , it insures they have vested interest in the care of that item. a collector will take of this. the family settled in kansas farming in early 1860’s. this is their legal property. it was going to be tossed out during barn cleaning, when i stepped in and bought it, knowing a collector would buy it from me and care for it. i agree with you that this item should be respected. the free market of commerce in america will decide who cares most for it , they will buy it and become steward and curator and caretaker. thanks. Thanks so much! I’ve gotten away from writing much lately. If you check back, you can see an update as to a resolution of the situation. that I extremely enjoyed the standard info an individual supply in your guests?